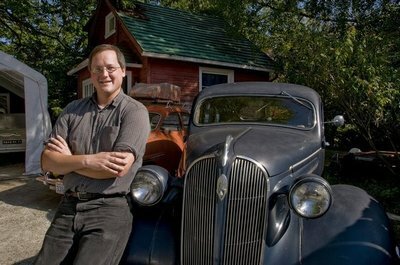 Mike Harrell, lecturer with the Department of Earth and Space Sciences, bought this 1937 Plymouth about six years back and drives it to work daily. Top, above: Harrell with his French KV Mini 1; below that, the elaborate hood ornaments on his 1937 Plymouth. 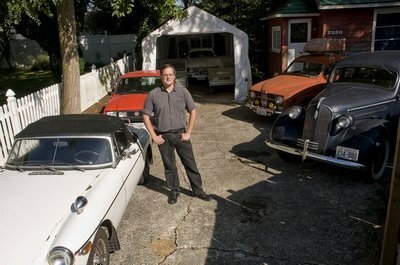 Mike Harrell with several from his ‘accumulation’ of cars. To the left is his MGB, behind that a red 1982 MG Metro; to the right his 1937 Plymouth, with a 1967 Saab behind that. Back in the garage is a working KV Mini 1 to the left, and another for parts at the right. Mike Harrell says he doesn’t collect cool old cars, exactly — it’s more that he accumulates them. And he has quite an accumulation. You might have seen Harrell, a lecturer and lab manager in Earth and space sciences, driving onto campus in a blue 1937 Plymouth sedan, an off-white 1974 “and a half” MGB or a wacky French “micro car” so minimal it’s barely roadworthy. Harrell has eight cars in all, the Plymouth the oldest. He said he doesn’t restore them so much as maintain them mechanically — and then, well, he drives them. Harrell has never bought a new or late-model car and never plans to. “I believe the (’82) MG Metro I bought a few months ago is the newest car I’ve ever owned,” he said. The four-door Plymouth would be at home on a gangster movie set with its long, sleek lines and art deco chrome hood ornament. Harrell said he saw the car for sale on the street in the Roosevelt area about six years ago and bought it straightaway. It needed work, though. He switched out the engine for another one that had been rebuilt in the 1970s but never used. “I got that for cheap so I had to tear it apart to make sure that everything survived. One of the valves was rusted from sitting for decades but it was far cheaper than rebuilding.” He rebuilt the transmission, rear end and brakes. Harrell also has a couple of little 1967 Saabs and a 1959 Ford that’s currently disassembled. 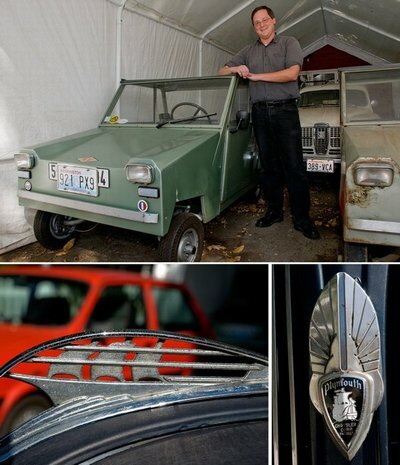 He rotates his commuting through his three-car “driving accumulation”: the Plymouth, the 1974-and-a half MGB — the half because it was during a midyear transition from chrome bumpers to rubber — and surely his oddest car, the French KV Mini 1, which looks almost like an oversized toy. “It’s a tiny little thing,” he said. “I recently took it to a show in Monterey, Calif., and it took Worst of Show, which was the top honor. The show was called the Concours d’LeMons” (“Celebrating the oddball, mundane and truly awful of the automotive world,” according to the Web site. Learn more here: http://www.concoursdlemons.com/). Oddball is right. The KV is, he said, “a one-cylinder, two-stroke car, 125 ccs, driven by a series of pulleys and a belt that rubs rollers against the tires. That’s what propels it. It’s a very unusual vehicle.” He has a second one he uses for parts; he owns two of the only three KV Mini1’s in the country. One thing though — the old Plymouth was manufactured without turn signals.